Xiaomi Minimalist Bag, Mi Power Bank 2, Mi Band 2, and Mi Pen Unboxing: Xiaomi Swag For Everyone! The hype on Xioami’s return to the Philippines is real: Upon the opening of the first Authorized Reseller store in Trinoma, throngs of people lined up to buy their favorite Xiaomi products. The best part of it is that as an Authorized Reseller store, customers get access to Xiaomi’s wide portfolio of products, ranging from smartphones to shoes. We got a few items in store, and we’re also excited to unbox and talk about these products as well! What we got: A Xiaomi Minimalist Backpack, a Mi Pen, a Mi Band 2, and a Mi Powerbank 2. Let’s get into unboxing each of them! Xiaomi’s backpacks are stylish AND affordable, and the Minimalist Backpack is no exception. This compact backpack has a dark gray polyester outer shell, along with an Urban lifestyle tag on the bag. All of the zippers with the Minimalistic Backpack sports Xiaomi’s Mi logo. The straps on the Minimalist Backpack is nicely padded, ensuring that your shoulders are comfortable for long hours of hauling the bag. Inside the bag, you have a teal lining for easy visibility of your belongings. You get a variety of pockets to keep your items organized. You have a dedicated slot for a laptop and tablet. The laptop slot can fit a slim 15-inch laptop like Apple’s 15-inch MacBook Pro Retina. The tablet slot is suited for an iPad-sized tablet. The Minimalist Backpack is priced at Php 1,399/$26.80. Among the more unusual items Xiaomi sells is a rollerball pen that has a minimalist look. The pen is dressed in andonized aluminum that is cool to the hand. Keeping its minimalist look, you have a chrome-plated clip with Xiaomi’s MiJia logo on it. Buying refills for the Mi Pen should be no problem: Any Parker-ballpoint cartridge will fit the Mi Pen. The Mi Pen is priced at Php 145/$2.78. The Mi Band 2 is one of Xiaomi’s popular products as it bagged a Red Dot award in 2017 for product design. 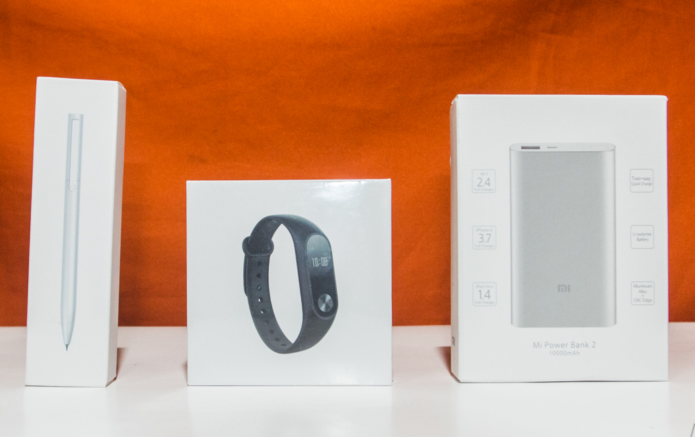 Upon opening the box, you have the Mi Band module, the charging dock, the silicone strap, and an instruction manual. The Mi Band 2 can record your number of steps, the number of calories burned, distance traveled, and can monitor your heart rate. It also has a sleep tracker for monitoring your sleep quality. The Mi Band 2 is compatible to both iOS and Android via the Mi Fit app. The Mi Band 2 is priced at Php 1,199/$22.97. Another popular product from Xiaomi, the Mi Power Bank 2 has a 10000mAh battery yet has a slim profile. In fact, it is one of the slimmest 10000mAh Power Banks out there. Inside the box, you have the Mi Power Bank 2, a MicroUSB cable, and an instruction manual. The Mi Power Bank 2 supports Quick Charge 2.0, so you can juice up supported phones quicker than usual. The Mi Powerbank 2 is priced at Php 699/$13.39.